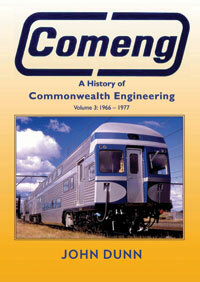 Volume 3 of the history of Commonwealth Engineering picks up the story where volume 2 left off in 1966. There were a number of milestone rolling stock contracts including the design and construction of the Indian Pacific trains to coincide with the inauguration of the first standard-gauge passenger train services across the continent from Sydney to Perth. Another was the design and construction of the interurban double-deck trains for the NSW Railways for service to Lithgow and Gosford. These were the first such doubledeck, air conditioned electric multiple units in the world and set the benchmark for the introduction of similar rolling stock in other countries. Comeng built these trains in a multiple of orders for some twenty years. And for Western Australia the company designed and built the 150 kph Prospector railcars-Australia's fastest train in those days. In 1973 the company took over the rival firm A. E. Goodwin. This allowed Comeng to enter the lucrative business of building Alco-powered diesel-electric locomotives, especially for the growing iron ore mines in Australia's northwest. At the same time the company turned out many hundreds of wagon for use in transporting the iron ore to the coast for export. In NSW there was an important move to decentralise operations by establishing a new plant at Mittagong. The South African plant - Union Carriage & Wagon - grew at an unprecedented rate, turning out multiple types of passenger trains, freight wagons, electric and diesel-electric locomotives, as well as the world-famous luxury express, the Blue Train. By the late 1970s Union Carriage was delivering on average a vehicle every three hours - the highest rate of any rolling-stock plant in the western world. During these years the Queensland plant won multiple orders for large numbers of aluminium wagons to service the expanding coal mines in the state. The company also continued to produce diesel-electric mainline locomotives as well as a steady stream of narrow gauge industrial and cane locomotives. In Victoria the company produced a new generation of tramcars for the Melbourne system - a business that was to continue non-stop for twenty years. In South Australia a very successful company was established to design and supply specialised track maintenance machines for all Australian railway systems. The company's long-established business of building buses and other road transport vehicles continued, as did the arm of Comeng that supplied curtain walling for the high rise buildings around Australia. A major development during this era was the establishment of a large industrial arm of the company that became a substantial supplier of earth-moving and mining machines, industrial ovens and fans, and other similar equipment. The company was now the largest rolling stock manufacturer in the Southern Hemisphere.